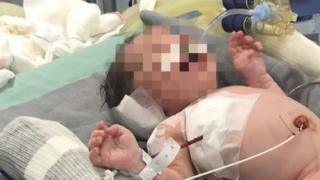 A Brazilian baby who was shot in the womb by a stray bullet has been deemed a miracle for surviving and his family hope he will overcome injuries to walk one day. Mother Claudineia dos Santos Melo was nine-months pregnant when she was shot while passing a gunfight in a favela in Rio de Janeiro state. Baby Arthur was born in an emergency caesarean, but is now paraplegic. However, there is hope that he may make some recovery. Gynaecologist José Carlos Oliveira, who is monitoring Arthur's progress, called his survival "a miracle happening before our eyes". "Today, he is paraplegic, but anything can happen in the life of this child," he said, adding that he had never seen a case like it. The mother's brother, Leonardo dos Santos, echoed the sense of hope when talking to BBC Brazil. "I want to see the baby grown strong and walk and run alongside the family," he said. "The relatives here are all praying together." Ms Dos Santos, 28, was days away from her due date and shopping for nappies when she was struck while walking in Duque de Caxias, north-west of Rio de Janeiro city, on Friday. The bullet entered her hip and hit her unborn baby, causing injuries in a number of places including his spine. Ms Dos Santos is said to be in a stable condition, breathing without aid. The baby's father, Klebson da Silva, 27, has visited the pair in hospital and told local reporters that he was filled with hope after seeing "victorious" Arthur. Ms Dos Santos may give her testimony to police from hospital on Tuesday, according to O Globo newspaper. Police have said they think she was hit by criminals, and not by officials fighting against them. Rights groups say civilians can often run the risk of finding themselves in the crossfire during police operations against heavily-armed drug gangs, particularly in impoverished favelas. Deaths from stray bullets are a big problem in Brazilian cities. According to a survey in newspaper Folha de Sao Paulo, 66 people were hit by stray bullets in the Rio metropolitan region from January to mid-May this year. Just over a third of those people died, said the paper. In June, a further 749 episodes of gunfire were registered in Greater Rio by the Cruzo Fogo app, which was developed by Amnesty International to map armed violence in the city. On Sunday, residents of favelas in Rio's north travelled to central Copacabana beach to protest against gun violence and call for peace in their neighbourhoods. Antonio Carlos Costa, founder of human rights group Rio de Paz, or Rio of Peace, told BBC Brazil the latest case has become a dramatic emblem for the cause. He said he felt the wider country, and the wider world, was largely indifferent to the problem. "These deaths do not mobilise the middle class because in the overwhelming majority of cases they take place in favelas," he said. "It is a pain of the poor, a misfortune suffered by the poor."